Thirty-seven paired colon cancer and its adjacent samples from The Cancer Genome Atlas (TCGA) were analyzed. Chip Analysis Methylation Pipeline (ChAMP) analysis was employed for differential methylated points (DMPs) and the differential methylation regions (DMRs) screening. The HOXD10 mRNA expression and DNA methylation levels were detected by RT-PCR. The Cell proliferation, migration, invasion and apoptosis were respectively measured by MTT assay, transwell assay, wound healing assay and flow cytometry assay in carcinoma cell lines after treated with 5-aza-2′-deoxycytidine (5-Aza-dC) or transfected with HOXD10-expressing plasmid. 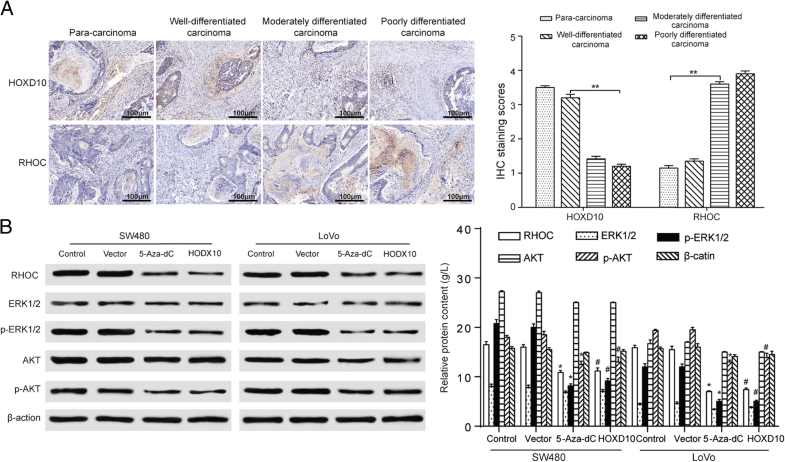 The expression of HOXD10 and RHOC was revealed by immunohistochemistry in disparate differentiation colon carcinoma tissues, and the dephosphorylation of AKT and MAPK pathways were detected by RT-PCR and western blot. The bioinformatics analysis demonstrated that HOXD10 was hypermethylated and low-expressed in colorectal cancer tissues. The detection of RT-PCR indicated the similar results in colorectal cancer cell lines and tissues. The induction of demethylation was recovered by treatment with 5-Aza-dC and the HOXD10 in colorectal cancer cell lines was re-expressed by transfection with a HOXD10 expression vector. The demethylation or overexpression of HOXD10 suppressed proliferation, migration, invasion and promoted apoptosis in colorectal cancer cells. HXOD10 suppressed the tumor growth and detected an opposite trend of protein RHOC. AKT and MAPK pathways were notably inactivated after the dephosphorylation due to the overexpression of HOXD10. HOXD10 was suppressed in colon adenocarcinoma cells, which down-regulated RHOC/AKT/MAPK pathway to enhance colon cancer cells apoptosis and constrain the proliferation, migration and invasion. The American Cancer Society (http://www.cancer.org) showed that colorectal cancer was the third leading cause of morbidity and mortality in the United States (US). In addition, the specific incidence rate (SIR) and specific mortality rate (SMR) of CRC was the highest in the World Health Organization (WHO) European region . The most effective therapeutic method for patients with CRC was complete surgical resection, provided the best possibility of long-term survival . It has been illustrated that CRC was still a major health problem in several studies [3–5] and the cancer burden of CRC was anticipated to increase over the next several decades in both developed and developing countries . However, the etiology and underlying molecular mechanisms of colorectal cancer are still unclear. Epigenetic gene silencing of anti-oncogene through promoter DNA hypermethylation is a common feature in human cancers . DNA methylation refers to the enzymatic addition of a methyl group to the 5 position of cytosine ring by DNA methyltransferase (DNMT) to generate 5-methylcytosine , which plays a vital role in the colorectal carcinogenesis . DNMT inhibitor 5-aza-2′-deoxycytidine (5-Aza-dC) is already used in the investigation of many different kinds of cancer, such as gastric cancer , breast cancer  and urothelial carcinoma  on DNA methylation of regulatory elements and gene expression. So far the knowledge of studies which investigate DNA methylation profile in recurrent CRC has been very limited. HomeoboxD10 (HOXD10) is a member of the homeobox gene family, which serves as important transcription factors targeting carcinogenesis-related proteins [13–16]. HOXD10 is regarded as the primary effector that negatively regulates neoplasm metastasis . Emerging evidence indicates that the expression of HOXD10 gene is regulated by DNA methylation. In gastric carcinogenesis, HOXD10 gene is downregulated through promoter hypermethylation . In hepatocellular carcinoma, HOXD10 gene is silenced by promoter region hypermethylation, which is associated with ERK signaling . The dysregulation of HOXD10 gene may be involved in diverse pathways that play important roles in tumorigenesis . In malignant breast cancer, loss of HOXD10 expression during the progression leads to the increment of the pro-metastatic gene RHOC . In gastric tumors, microRNA-10b can promote cell invasion and provoke the up-regulation of RHOC and phosphorylation through targeting HOXD10 . However, the methylation status of HOXD10 and mechanism of action in colon cancer with RHOC and AKT pathway are still unclear. The mitogen-activated protein kinase (MAPK) pathway is a key regulator for apoptosis related to most of the hypermethylated genes while the PI3K/AKT signaling pathway is involved in proliferation process in colorectal cancer . MAPK pathway is over expressed and associated with functional mutation of HOXD10 gene in human cholangiocellular carcinoma  and ovarian cancer . The phosphorylation activation of extracellular signal-regulated kinase (ERK) is a vital regulator for the metastasis and viability of cancer cells . Nevertheless, the underlying molecular mechanisms between the above-mentioned pathways and CRC-associated gene HOXD10 remain unknown. This study was designed to confirm the mechanisms and the expression level of HOXD10 in CRC. We determined HOXD10 for the follow-up studies, which showed hypermethylation and decreased mRNA expression in CRC. 5-Aza-dC treatment can alter the DNA methylation level of HOXD10. Our results revealed the overexpression of HOXD10 had adverse influence on colorectal cancer. For RT-PCR analysis, 15 pairs of frozen colon adenocarcinoma and its adjacent normal tissue specimens were collected from patients with CRC that were diagnosed from 2016 to 2017 at the Department of Gastroenterology and Hepatology, Sun Yat-sen Memorial Hospital. No other therapy, including radiotherapy, chemotherapy was performed prior to entry into the research. Samples used in the study were certified by local ethics committees, and all subjects were given informed consent from patient with available follow-up information. The colon cancer dataset was obtained from The Cancer Genome Atlas (TCGA) data portal (https://gdc.cancer.gov/). Data for 74 patients were available with complete DNA methylation and were evaluated via the Illumina Infinium Human Methylation 450 BeadArray platform. DNA methylation index (MI) was accounted as β-values. The mean methylated (M) and unmethylated (U) signal intensities for each sample and locus were calculated by the formula (β = M/ [M + U]). 5-Aza-2′-deoxycytidine (5-aza-dC) (Sigma-Aldrich, USA) was dissolved in DMSO at 50 mg/ml. Cell lines were plated in 1 × 106 cells/ml for 24 h and treated with 0.5 μM 5-Aza-dC in 0.5% DMSO for 24 h, before growing for 7 days. Cells were harvested for RNA and DNA extraction. Total genomic DNA was extracted by DNA extraction kits (Qiagen, USA) in tissue samples. The DNA content and purity (A260/A280 > 1.8 was considered qualified) were detected by ultraviolet spectrophotometer (Perkin-Elmer, Waltham, MA, USA). The modified DNA was given MSP and non-MSP, respectively (Table 1). The 3% agarose gel was applied to electrophoresis and ethidium bromide in order to stain. R result analysis was detected by gel imaging system (Bio-Rad, Hercules, CA, USA). Total RNA (1 lg) was extracted from the CRC cell lines and normal tissue samples using TRIzol reagent (Thermo Fisher Scientific, Waltham, MA, USA). Single-stranded cDNA was subsequently synthesized using an ABI high-profile cDNA synthesis kit (Invitrogen, Carlsbad, CA, USA). The primers were designed by Taqman gene expression assay (Thermo Fisher Scientific, Waltham, MA, USA). The threshold cycle number was automatically determined by ABI 7500 software (Applied Biosystems, CA). The PCR conditions were as follows: 95°Cfor 10 min and then 45 amplification cycles of 94 °C for 20 s, 55 °C for 30 s, and 70 °C for 30 s. The cycle threshold (Ct) values were recorded for both HOXD10 and GAPDH, which was used as an endogenous control. The expression level of HOXD10 was calculated using theΔCt method. All the samples were assayed in triplicate. The primer sequences for the qRT-PCR are listed in Table 2. Full-length HOXD10 cDNA (GenBank accession number NM_002148.3) was cloned into the pcDNA3.1 expression vector. Transient transfection was performed using Lipofectamine 3000 (Intrivogen, Carlsbad, CA) according to the manufacturer’s instructions. Empty pcDNA3.1 expression vector was transfected as vector control. Cell pellets were solubilized in electrophoresis sample buffer, sonicated for 10 s, and boiled for 10 min. The protein concentration of cell lysates was measured, and 3 mg protein was separated by SDS-PAGE, and then transferred to a polyvinylidene fluoride microporous membrane (MILLI-PORE, Billerica, MA). Membranes were blocked in PBS with 5% milk powder and probed with anti-AKT (ab81283, ABcam, USA), anti-ERK (ab54230, ABcam, USA), anti-β-actin (ab11003, ABcam, USA), anti-RHOC (ab64659, ABcam, USA), anti-p-ERK (ab201015, ABcam, USA), ani-p-AKT (ab38449, ABcam, USA), at 4 °C overnight. After washing, the membrane was cultured with HRP-linked goat anti-rabbit Ab (Cell Signaling Technology). Blots were visualized by ECL (ECL Plus; Amersham Pharmacia Biotech, Uppsala, Sweden), on the basis of the manufacturer protocol. Results were captured digitally using a LAS1000 Lumino Image Analyzer (Fuji Photo Film, Tokyo, Japan). SW480 and LoVo cells were incubated at 1 × 104 cells/well in 96-well plates. Cells were harvested for 24 h at 37 °C in the presence of 5% CO2, before the medium took the place of serum-free medium. The cell lines were treated with 5-Aza-dC (1 μM) at 0 h, 24 h, 48 h, 72 h, 96 h and cell proliferation was detected using the MTT assay. Absorbance at 490 nm was surveyed by a microplate reader (Labcompare, San Diego, CA, USA). The tumor cell migration capacity was evaluated by the wound-healing assay. In short, 1 × 106 cells were seeded in six-well plates, cultured overnight, and transfected with HOXD10 expression vector or empty vector. The cell layer was scratched with a sterile plastic tip when the culture had reached approximately 90% confluency, followed by washing with culture medium twice and cultured again for 48 h with serum-reduced medium containing 1% FBS. At different point in time, photographic images of the plates were captured under a microscope and the data were summarized on account of sextuple assays for each experiment. The ability of cell invasion was appraised by 6.5-mm Transwell chambers with a pore size of 8 μm (Corning, USA). A concentration of 50 μg/chamber of a basement membrane pre-coated the Transwell upper chambers in the form of Matrigel (BD Biosciences, USA). Putting RPMI-1640 with 10% FBS into the bottom chamber, before CRC cells (3 × 104/chamber) were seeded in serum-containing media in the upper well of the Transwell chambers. The cells were harvested for 48 h, and then removed those that not yet invade through the pores with the cotton swab. The invasive cells in chamber under the filter surface were immobilized in 70% ethanol, dyed with 0.1 mg/ml crystal violet solution, and counted below a microscope (× 20 magnification). Specific experiments had inserts in triplicate, and five selected fields were counted per insert at random. Cell apoptosis was detected by the Annexin V-FITC apoptosis detection kit on the basis of the manufacturer instructions. In brief, a total of 3 × 105 CRC cells and various concentrations (10, 25, 50,100 μmol/L) of emodin were added to the wells after 24 h of incubation at 37 °C. The control group was treated with the equivalent quantity of DMSO (0.2%). Cells of each sample were harvested after an additional 12 or 24 h and suspended in 500 μl of Annexin V binding buffer (1X). Annexin V-FiTC (5 μl) and 5 μl of propidium iodide (PI) were added and incubated for 15 min in dark. The stained cells were evaluated by flow cytometry using a FACS Calibur (BD Biosciences, San Jose, CA, USA). After collection of the tumor, 5 μm thin sections of colorectal cancer were immobilized in 4% Paraformaldehyde (PFA) and then embeded in paraffin. Sections were placed on poly L-lysine coated glass slides, immunostained with Envision Flex mini kit (Dako) and in a graded alcohol series to dehydrate and then embed the paraffin. The Anti-Ki67 antibody (Abcam, USA, ab15580) was used to the sections (1:250), and then harvested overnight. The tumor sections were cleaned, which applied (1:500) an anti-Rabbit secondary antibody (Abcam, ab98488). GraphPad Prism 6.0 Software (GraphPad Inc., La Jolla, CA, USA) was used analysis statistical. All results were repeated for three times. One-way analysis of variance (ANOVA) tested differences of expression among different groups. A figure of P < 0.05 was supposed to statistically significant. According to CpG island neighborhood (shores, shelves, islands, and opensea), the distribution of top 1000 CpG sites which were differentially methylated demonstrated that the CpG regions based on island of the notably hyper- or hypo- methylated CpG sites were scattered separately. 53% of the hypermethylated CpG sites can be seen in CpG islands. In contrast, shelf had the least CpG methylated sites, and just 4% of the hypermethylated CpG sites were in this region (Fig. 1a). Based on the position relative to genes (1stExon, 3’ UTRs or 5’ UTRs, body, IGR, Transcription Start Sites 1500 bp), the distribution of top 1000 differentially methylated CpG sites illustrated that the highest level of probes was situated in the body (Fig. 1b). The distribution of top 1000 differentially methylated imprinted CpG sites (Fig. 1c) was showed the information of synthesized epigenetic and genetic annotation. All the above, the probes which were differentially methylated were scattered separately primarily in the CpG islands in comparison to the integrated distribution of all probes. 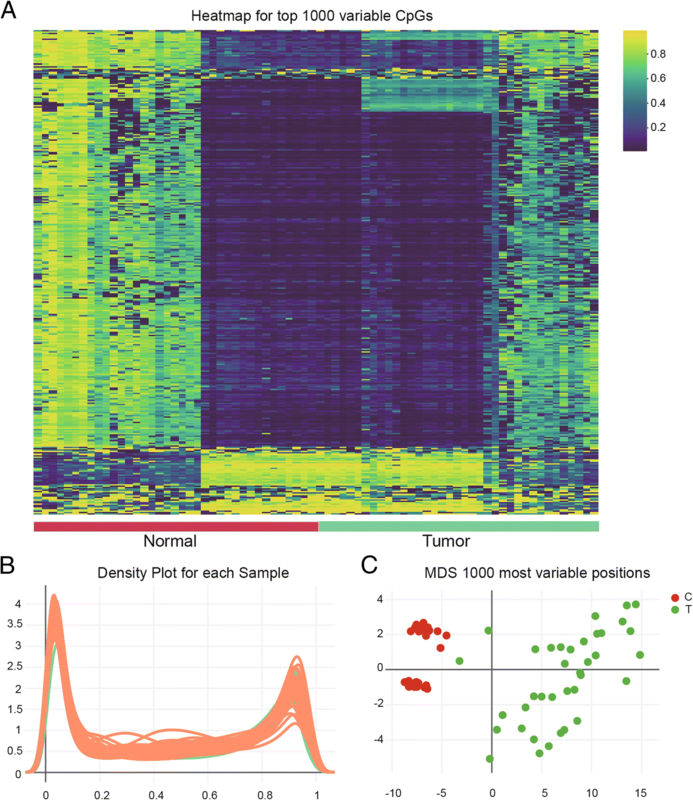 The heatmap of top 1000 differentially methylated imprinted CpG sites illustrated a massive difference of DNA methylation situation between the carcinoma and benign samples (Fig. 2a). In comparison of β-value distributions (0 indicating unmethylated sites, 1 indicating fully methylated sites) density plots from every sample, which were used to analyze poor performing arrays on account of a large deviation from the remaining of the samples (Fig. 2b). Multi-dimensional scaling (MDS) plot indicated variant clustering of normal vs. tumor tissues (Fig. 2c). Overall, we chose quality samples, indicating the significant difference between normal and tumor group. 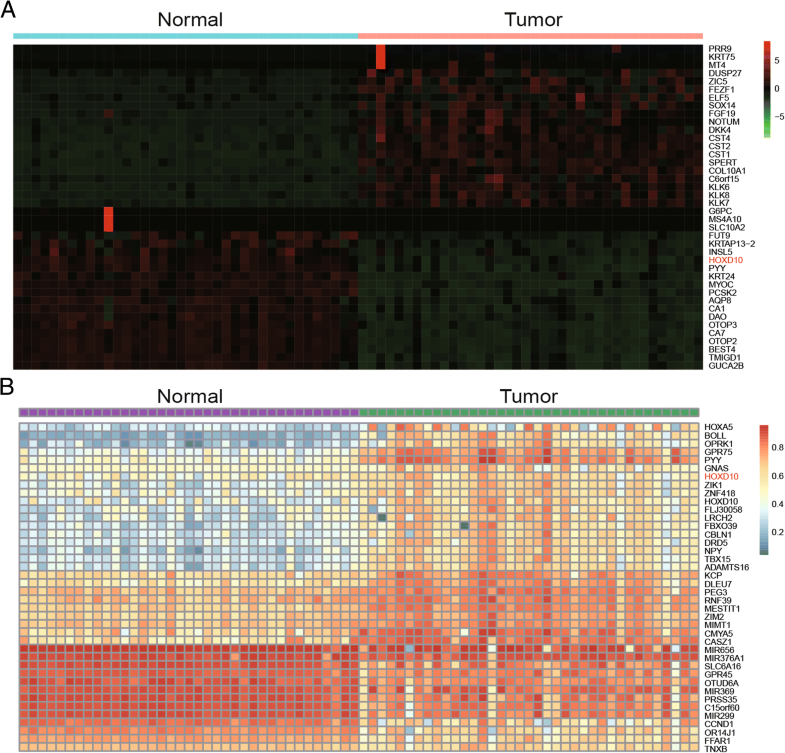 The heat map of top 40 differentially mRNA expression in tumor and paired surrounding tissues indicated that mRNA expression was lower in colon tumor tissues than the counterpart (Fig. 3a). 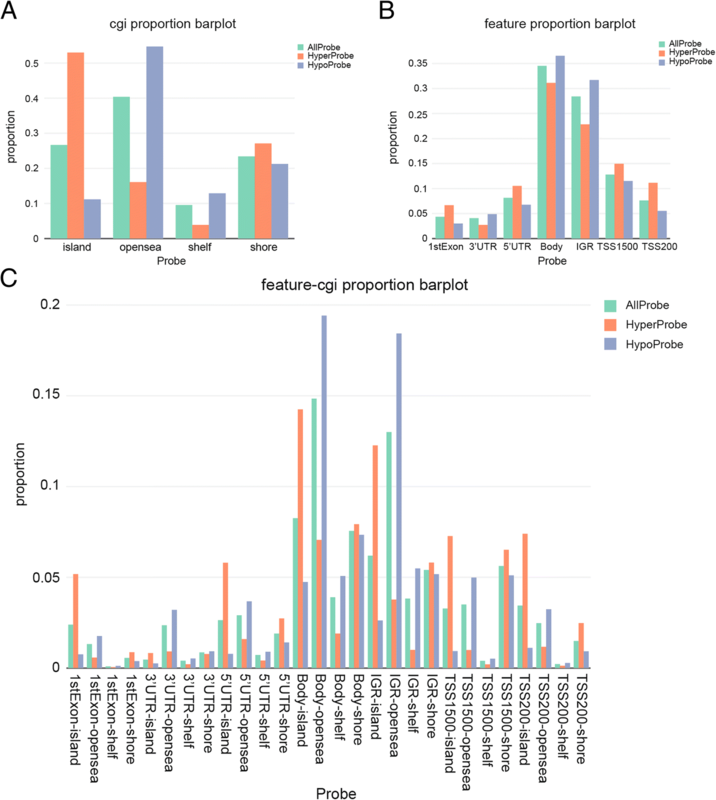 The top 40 differential methylation genes were analyzed by differential methylation analysis, showing the higher HOXD10 methylation in carcinoma tissues vs. non-tumor tissues (Fig. 3b). To sum up, the decreased mRNA expression and hyper-methylation of HOXD10 can be manifested in tumor group. According to the differential methylation region (DMR) analysis, all 951 genes filled with DMR-related CpGs and HOXD10 were hyper-enriched by CpGs related to DMR (Fig. 4a). The relevant heatmap indicated the normalized methylation data were showed in a blue-red scale from lower to higher methylation. Besides, a differentially methylated region 540(DMR_540) of HOXD10 indicated the remarkable difference in normal group and carcinoma group which had a higher value than the normal group (Fig. 4b). Although no statistical significance was found, high HOXD10 methylation tended to be associated with poorer prognosis by Kaplan-Meier (logrank P = 0.15).The log-rank test was used to calculate P values (Fig. 4c). It has been illustrated that CpG sites with the identical CpG Island tend towards behave in an integrated manner. 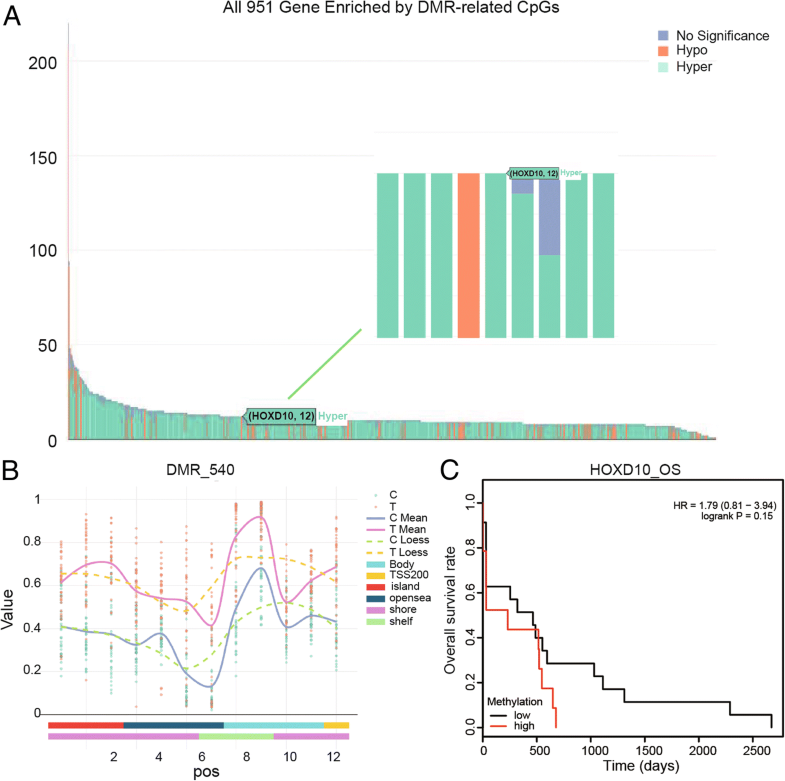 We used this feature of DNA methylation to study changes in different regions between cancer tissues and adjective normal tissues and recognized DMR_540 for HOXD10. Boxplots of methylation data for 8 differentially methylated imprinted sites for HOXD10 revealed an ascending methylation in the cancer group. Boxplots such as cg 13,217,260, cg 03918304, cg 05979020, cg 25,371,634, cg 18,115,040, cg 21,591,742, cg 20,649,017 and cg 10,364,040 were shown in Fig. 5a-h. To sum up, these results indicated that DNA methylation level of HOXD10 in CRC was boosted. We analyzed the HOXD10 methylation levels in 15 CRC and 15 para-carcinoma tissue. Constant methylation was observed in CRC, but less in paired non-cancer tissues,the typical result can be seen in Fig. 6a. ‘Pos’ represented the positive controls for the methylated (M) and unmethylated (U) allele. The normal peripheral lymphocytes DNA which served as negative control were included for each PCR.HOXD10 were confirmed hypermethylation in colon cancer cell lines SW480,LOVO and LS180 compared with normal colon cell line CCD18-Co (Fig. 6b). MTT assay determined the minimum effective dose of 5-Aza-dC, and showed difference at 1 μM, which was selected to conduct following experiments (Fig. 6c). HOXD10 expression was determined by RT-PCR, indicating that the methylation level of HOXD10 decreased after 5-Aza-dC treatment in SW480, LoVo, HT29 and HCT-116 cell lines while LS180 cell line showed little change (Fig. 6d). DNA methylation can be efficiently induced by DNA methyltransferase, whose activity was restrained by 1 μM 5-Aza-dC (Fig. 6e). The demethylation of HOXD10 after treatment with 1 μM demethylation agent for 72 h in colon carcinoma was analyzed using RT-PCR. 5-Aza-dC (1 μM) treatment decreased HOXD10 methylation in SW480, LoVo, LS180, HT29 and HCT-119 cell lines (Fig. 6f). To investigate the function of HOXD10 in colorectal tumors, we transfected CRC cells with a HOXD10 vector or empty vector and then confirmed the level of mRNA. The empty pcDNA3.1 expression vector group (Vector) was used as negative control versus HOXD10-expressing vector group and the control group with no treatment or transfection was used as blank control. The mRNA expression of HOXD10 in SW480, LoVo and LS180 cell lines was higher after treatment with 5-Aza-dC (1 μM) for 72 h, which was similar to the overexpression of HOXD10. (Fig. 6g). In conclusion, 1 μM 5-Aza-dC were chosen in the following experiments as demethylation agents, and the demethylation and mRNA expression of HOXD10 increased after the treatment of 5-Aza-dC or overexpression of HOXD10. The cell proliferation was restrained after demethylating or overexpress the HOXD10 by seeding SW480 and LoVo cell lines for MTT assay (Fig. 6h). 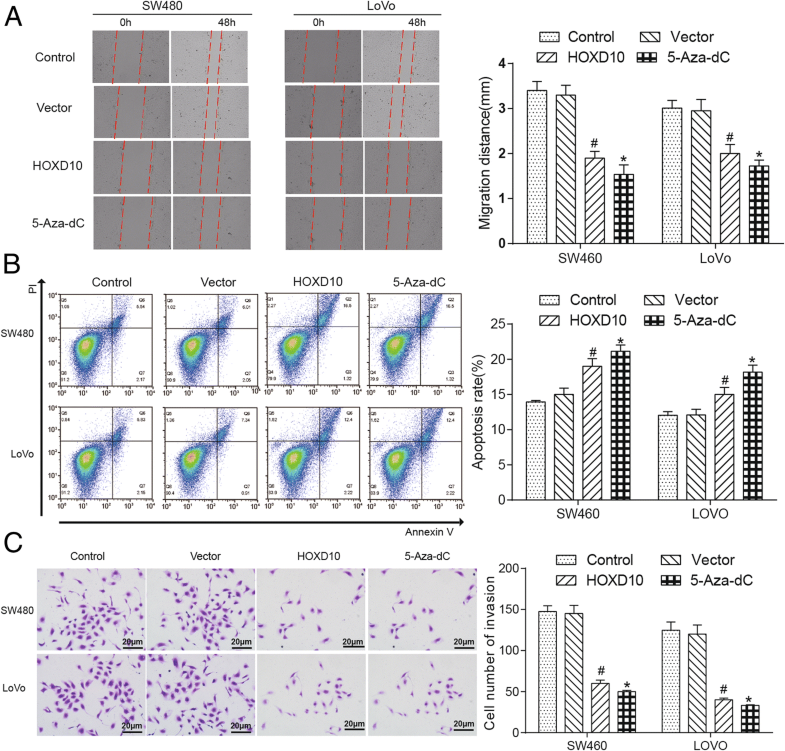 The cell migration ability in tumor cell lines, which determined by Wound Healing assay, was inhibited after the treatment of 5-Aza-dC or overexpression of HOXD10 from Fig. 7a, left, which captured at 0 and 48 h after the wound was made, and corresponding histograms showed the same trend (Fig. 7a, right). The cell apoptosis rate in SW480 and LoVo cells was remarkable increased by flow cytometry analysis (Fig. 7b, left), and the related histogram showed the evident increment of apoptosis rate (%) (Fig. 7b, right). And CRC cell invasion ability was dramatically suppressed by overexpression of HOXD10 in SW480 and LoVo cells from the figure of flow cytometry assay (Fig. 7c). Based on the above observations, it was probably that HOXD10 functioned as a cancer suppressor by restraining the cell proliferation, migration, invasion and promoting the cell apoptosis in tumorigenesis of the colon. HOXD10 protein level was evaluated in carcinoma or para-carcinoma tissue from patients with CRC via immunohistochemistry (IHC) in order to investigate how HOXD10 had an effect on CRC. Lower HOXD10 and higher RHOC expression can be seen in poorly-differentiated CRC tissues form the result of immunohistochemical stainings. The HOXD10 staining was primarily positioned in the cell nucleus, however, the RHOC staining was localized in the cell cytoplasm. The HOXD10 stainings are strong, strong, moderate and weak in para-carcinoma (× 100), well- (× 400), moderately- (× 400) and poorly-differentiated carcinoma (× 400), respectively, while the RHOC stainings are weak, weak, moderate and strong in the same carcinoma groups, respectively. (Fig. 8a, left) Statistical plot illustrated IHC staining scores in different stages of carcinoma (Fig. 8a, right). The RHOC protein levels showed a significant decrease in the HOXD10 overexpressed group and 5-Aza-dC group. 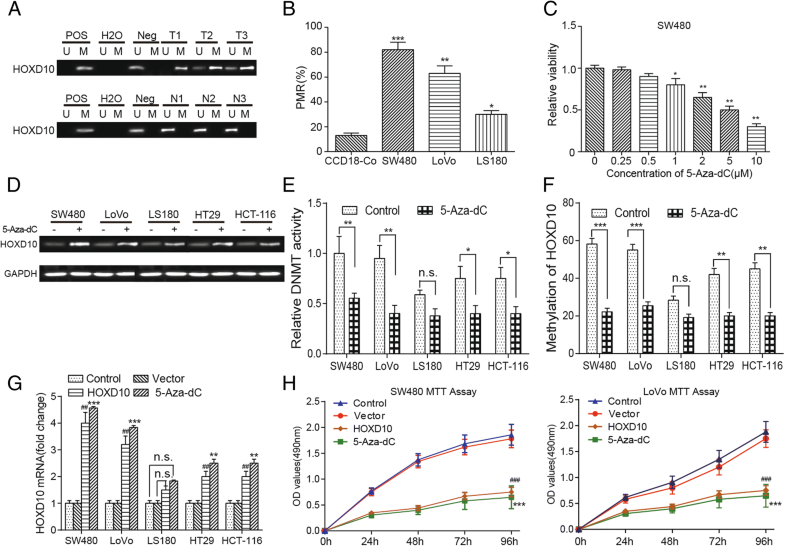 The up-regulation of HOXD10 resulted in AKT and ERK/MAPK dephosphorylation, demonstrating that the AKT and ERK/MAPK pathways were markedly inactivated (Fig. 8b, left). Statistical plot showed the relative protein expression in RHOC/AKT/ERK in SW480 and LoVo cells (Fig. 8b, right). The results turned out that RHOC was a pivotal negative mediator of CRC development depending on HOXD10 and also a gene that the AKT and ERK/MAPK pathways were involved in. In this research, we had uncovered that HOXD10 played a vital role in the progression of the colorectal cancer. The evidence has been provided HOXD10 showed hypermethylation and decreased mRNA expression in CRC. Also, we focused on analyzing the pro-metastatic gene RHOC and the phosphorylation activation of the AKT and MAPK signaling pathways altered after HOXD10 demethylation. Exploring the role of anti-oncogenes HOXD10 in human colorectal would lead to a deeper understanding of the underlying mechanism of CRC, as well as stimulate the development of new treatment strategies. DNA methylation could cause transcriptional silencing of anti-oncogene, which was a common epigenetic modification. Existing research indicated that the methylation of cancer suppressor genes was in close relationship with cancer development . Growing evidence showed clearly that the CpG island hypermethylation in oncogenes played a fundamental role in the process of colon cancer development [27, 28]. Previous studies have showed that HOXD10 which was aberrantly hypermethylated in papillary thyroid cancer may act as a tumor suppressor . HOXD10 was upregulated in 82 (89.13%) normal gastric mucosa samples and in 242 of 436 (55.5%) cases of gastric cancer . Lin et al. showed that of promoter hypermethylation HOXD10 combined with ZIC1 and RUNX3 might be a potential early detection of gastric cancer and precancerous lesions . Daugaard et al. demonstrated that homeobox gene family including HOXD10, HOXD3, HOXB3/HOXB4 have potential as biomarkers in lung adenocarcinoma . Thus, HOXD10 was aberrantly hypermethylated in various carcinoma, which showed the potential of it as biomarker or therapeutic target. Similarly, our study illustrated the HOXD10 hypermethylation and low mRNA expression in colorectal carcinoma tissues and cells. 5-aza-2′-deoxycytidine (5-Aza-dC) can reactivate epigenetically silenced genes, which was able to inhibit DNA methylation . Besides, 5-Aza-dC is the clinically approved DNA methyltransferase inhibitors (DNMTi) . It is reported that 5-Aza-dC was used in colorectal carcinoma cell lines for APC gene, which methylation promoted the migration and proliferation abilities . Moreover, after the treatment with a DNA methyltransferase inhibitor 5-Aza-2′-deoxycytidine, the methylation degree of HOXD10, which was correlated with decreased transcript expression, was restored in oral cancer cell lines . Our study has illuminated that HOXD10 might function as a vital effector that negatively regulated the metastasis and development in oncogenesis of the colon after the treatment of 5-Aza-dC. Fassan M et al. has proved that a weak cytoplasmic HOXD10 IHC cytoplasmic positivity with membranous reinforcement can be seen in normal samples while 80% breast cancer tissue samples indicated moderate to strong positivity cytoplasmic HOXD10 IHC positivity . The result of IHC indicated that positive rate of HOXD10 protein expression dropped gradually with the increment of histological grade in CRC patients, which was closely connected with a higher expression of pro-metastatic gene RHOC, a gene related to the AKT and MAPK pathway. The same result can be seen in human cholangiocellular carcinoma, the HOXD10 expression was pretty high in well-differentiated cancerous tissues (25/28, 89.3%), while the HOXD10 was lowly expressed in well-differentiated cancerous tissues (25/28, 89.3%) . It has been demonstrated that abnormally activated AKT and MAPK pathway is closely associated with growth and metastasis of CRC [37–40]. Previous research suggested that inactivated MAPK/ERK and PI3K/AKT signaling pathways resulted from decreasing the phosphorylation of ERK1/2 and AKT, which were classical signal transduction pathways and played a significant role in colorectal carcinoma progression . In conclusion, the high methylation and low relative mRNA expression of HOXD10 in CRC tissue microarray data, cell lines, and tumor tissue samples, combined with the loss of function associated with the AKT/MAPK signaling pathway for the role as anti-oncogenes in the pathogenesis of CRC. Follow-up studies are needed to completely evaluate HOXD10 in colorectal carcinoma, thus make detailed risk analysis and prognosis easier. Our findings gave an in-depth understanding of HOXD10 methylation involved in the development of colorectal cancer cell metastasis, which may serve as a possible target for therapy in times to come. Yu-hong Yuan and Han-yu Wang contributed equally to this work. This work received Grant (2013) 163 from the Key Laboratory of Malignant Tumor Molecular Mechanism and Translational Medicine of Guangzhou Bureau of Science and Information Technology, and Grant No. KLB09001 from the Key Laboratory of Malignant Tumor Gene Regulation and Target Therapy of Guangdong Higher Education Institutes also supported the present study. Substantial contribution to the conception and design of the work: YY, HW and WZ; Analysis and interpretation of the data: WL, FY and YL; Drafting the manuscript: YY, ZY and HW; Revising the work critically for important intellectual content: YL and JC; Collecting of grants: YL. All authors read and approval the final manuscript. All procedures performed in studies involving human participants were in accordance with the ethical standards of Sun Yat-sen Memorial Hospital. Written informed consents were obtained from all individual participants included in the study.